At Imperial Dental Associates, we know that traditional metal braces were long considered the treatment of choice for straightening teeth, and they are still a popular solution today. Increasingly, though, patients are asking us about Invisalign, known as the “clear alternative to braces.” Both braces and Invisalign can treat most orthodontic issues, and in most cases, we will leave the decision up to you. Here are things to consider when deciding which is right for you. Both braces and Invisalign require a great deal of treatment planning, but each option looks quite how the braces will fix them. However, we cannot show you what you will look like at the end. different. When planning for braces, we will show you the problems with your teeth and explain Once the braces are in place, we will handle the adjustments, and you will not see your bare teeth again until your treatment is over. Invisalign treatment planning uses sophisticated 3-D computer imaging to create a digital model of your existing smile. We will morph the model to show you the results at each stage, and then use the model to create your customized series of aligners. You will change aligners at home as directed, allowing you to keep a close eye on your progress. Which is right for you depends on your personality. Those who love surprises might enjoy the big reveal at the end of braces treatment. Planners who like to know what to expect at all times generally feel more comfortable with Invisalign. Invisalign also works best for patients that take control of their treatment, because much of treatment success depends on patient compliance. 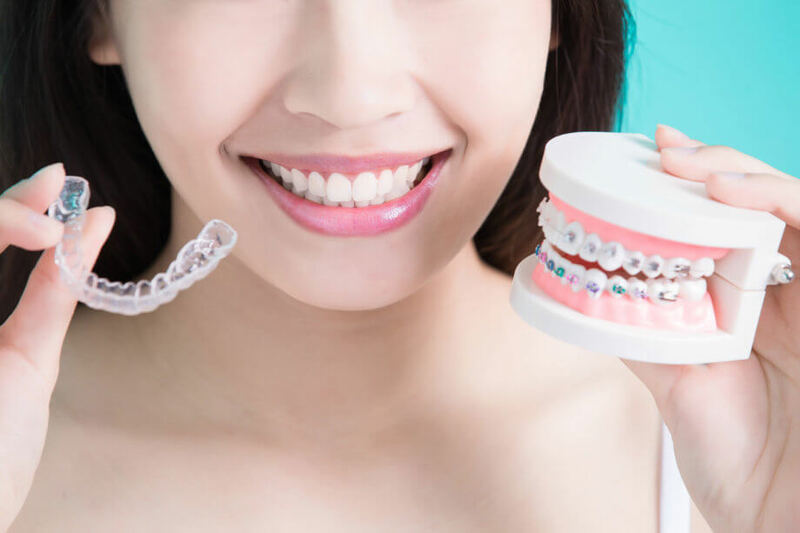 For instance, if you are one that tends to get side-tracked or loose things braces may be the better alternative since you do not take them in and out yourself. Traditional braces are under our control. We place them, handle the adjustments, and remove them. You will need to learn to care for your teeth and braces and memorize a list of off-limits foods, but otherwise you only need to remember to keep your appointments. If you experience any problems, such as a popped wire or a loose bracket, you will need to make an emergency appointment. Invisalign is under your control. We will place attachments on your teeth, show you how to care for your aligners, and monitor you at visits every four to six weeks. Beyond that, though, it is in your hands. You will wear your aligners 20 to 22 hours per day or as directed, and change them at home every two weeks or as instructed. You can remove them to eat and drink and perform oral hygiene, but you need to remember to clean them and put them back in. Again, which is better is up to you. If you are a responsible person who likes to be in control, Invisalign is probably the best choice. If you have a lot on your mind and don’t want to keep up with something new, braces are likely better for you. Most people agree that Invisalign aligners are more comfortable than braces. You might feel some discomfort when the attachments are placed, but the smooth, medical grade aligners have no sharp edges to scrape, poke, or scratch your mouth. The attachments are tooth colored, and the aligners are clear, so they are much less visible than traditional metal braces. Invisalign uses a transparent pricing model that includes not only the aligners but also all office visits. Dental insurance is complicated and varies widely by plan. Yours may cover braces, Invisalign, neither, or both. Our experienced office staff will help you understand exactly what yours covers and what your out of pocket costs will be. If you would like an experienced and compassionate dentist to help you choose between Invisalign and braces contact Imperial Dental Associates at 203-227-2520 to schedule your first appointment.